Today we had a chance to spend the morning with 3rd graders from Creekside Elementary School and the BHSU Sustainability program. Together, we explored the function of animals on the farm and delved into the carbon cycle, observing that nature doesn’t farm without animals. There was also a seemingly necessary amount of ogling chickens and snuggling lambs. We peeked in the greenhouse to see how things had changed since their classmates had been out to visit the farm in early March. …and discussed the benefits of rotational grazing and farm animal poop as regards to sequestering soil carbon and mitigating climate change. The students brainstormed a whole suite of ways we can personally reduce the amount of CO2 we are contributing to the atmosphere: riding bicycles and walking, not wasting electricity, planting trees, recycling, growing your own food or eating food grown locally. Smart kids. Additional, tangential topics covered this morning included: food miles, butchering livestock, growing cabbages, alternative energy, hogs used for tree stump removal, the indispensable function of pollinators, annuals vs. perennials, and how riding bicycles is the smartest thing ever. And we did a few jumping jacks. There is a great quote from Robert Michael Pye (from The Thunder Tree: Lessons from an Urban Wildland), where he talks about the extinction of experience, how people are losing personal contact with nature, how all-round bad that is, and how we need to get our act together and remedy this. “People who care conserve; people who don’t know don’t care. What is the extinction of the condor to a child who has never known a wren?” Like natural areas and open spaces, we seem to have grown disconnected to agriculture, farms, food production. And similarly, as we’ve become more removed from where our food comes from, we’ve set in motion a cycle of disaffection. 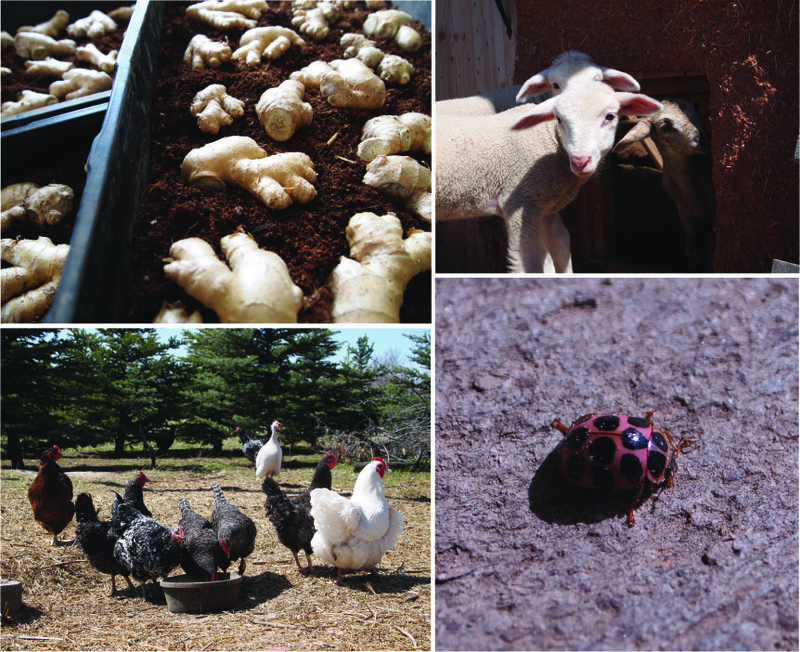 Bring kids to a farm, introduce them to lambs and chickens and talk about soil fertility and humane slaughter, and it leads to not just an awareness, but a sense of responsibility. What a treat to be able to share our farm with you. Big thanks, all! farm update, with bonus photos! We’ve wrapped up our beet and kohlrabi planting and have tucked in to warm our fingers. The early morning misty drizzle has evolved to a drippy, more stout rain. Quickly turned snow. It’s a good time for a farm update. The greenhouse is glowing these days. We’ve just started pulling out radishes, baby bok choy will be next. The earliest seeds have been sown out in the back field. Snap peas, garlic, and spinach have already popped up and favas, radishes, turnips, carrots, and beets should follow soon. It’s snowing now, but the soil has already warmed up this spring; once this melts off we’ll transplant out our earliest kales, mustard greens, lettuce, and green onions. We have added a few more fruit trees into the orchard. A couple of these are Evans cherries – especially cold hardy, tart cherries, which already seem quite at home here. We had the opportunity to learn how to graft at the MOSES conference scion exchange and, this past week, we planted four trees that we grafted ourselves(!) – three apples and a pear. 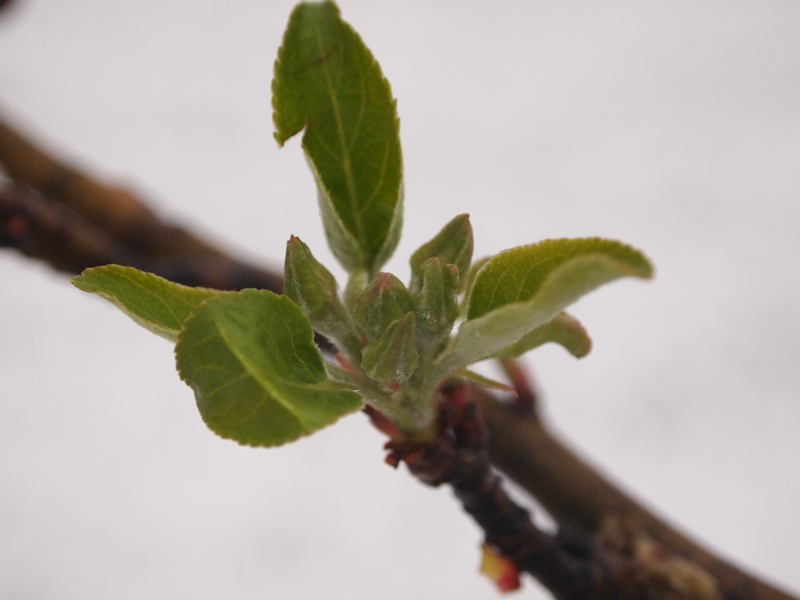 Two of the apples are already budding from the scion wood end, the other apple and pear are either late budders or we botched the graft. Much of our time in the field these days has been shuffling things around. Materials handling: moving straw bales out to the beds for mulching, spreading wheelbarrows of compost, laying down wood mulch, flipping and sifting the compost pile, cleaning out the coop, leading sheep out to the field in the morning, herding them back to the garage at night, carting out seed trays, piling brush, vine clippings, and downed branches. We are applying compost to the especially heavy feeders like the hops and ginger, and adding it to help build soil in the close windmill bed. We’ll be using straw bales again this year for hilling the potatoes. It worked well last year, not only for hilling the plants, but also for weed suppression and it made harvesting easy-breezy. Straw bales will go out in other rows too. Last year, we found mulching the beds worked well for keeping in soil moisture, providing lovely habitat (for worms, spiders, snakes, insects… and pocket gophers) and for reducing the amount of time we had to spend weeding the beds. Heavy mulch made a pretty good dent in our quack grass, and by keeping the soil so moist and loose (by worms, etc), the remaining rhizomes are a lot easier to remove in big pieces than in past years. It will still take a number of years before our rows are mostly clean, but we’re making progress. We have to wait until the soil warms further to see how the straw is doing with the bindweed/creeping jenny, that one will certainly prove a harder challenge. We’re using woodchips from a local landscaper for mulching grape vines and hops, as well as between the rows in the front field to help reduce weed growth. Everything is pruned for the season and now things are starting to bud out. We’re feeling grateful for the help we’ve received this spring. Not only are the extra hands literally very helpful, it’s also a treat to get to spend time with friends and family. It means heaps that you are willing to spend your time out here with us, getting dirty. We’d like to share special, super enthusiastic and muddy high-fives with SDSU’s Horticulture Club. HOLY SMOKES. 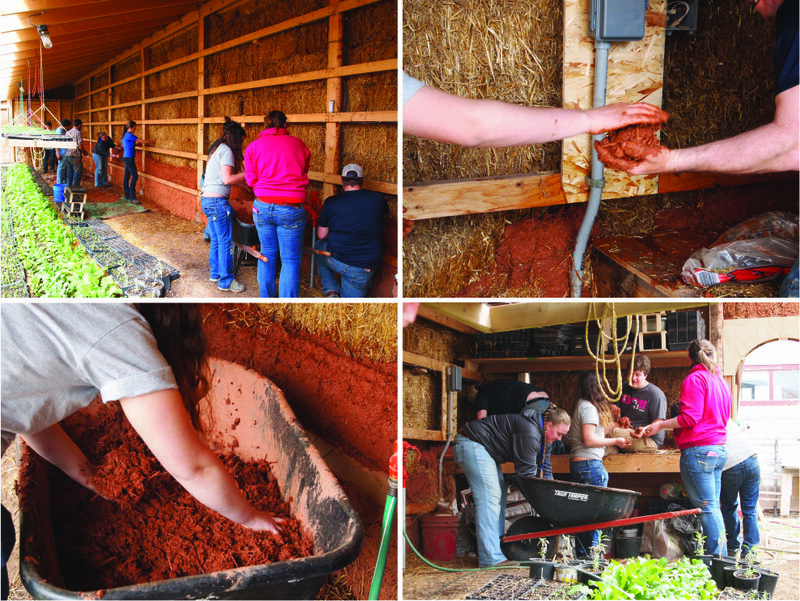 Yesterday, a van-full of students from SDSU came out to the farm and helped us get a whole layer of cobbing done on the north wall of the greenhouse. With excellent conversation and in less than an hour we accomplished twice as much as it takes the two of us a full, long morning to do. Not only did these strong hands help us with the cobbing, they also offered us a short course in lamb/livestock husbandry, organic pest control techniques, and worm barrel composting. This is the future of agriculture in South Dakota – better hold on to your hat, Chicoine. Comrades in mud, thank you. Please come back again. Here are some photos from our work together. The greenhouse is designed as a passive solar structure. 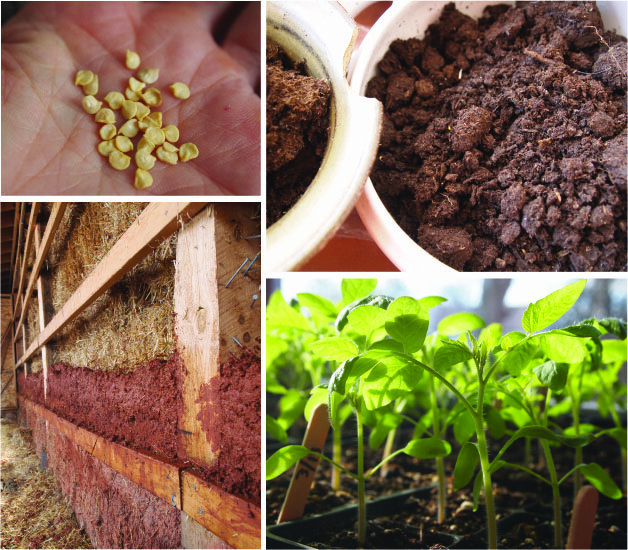 The north wall is strawbale and cob. 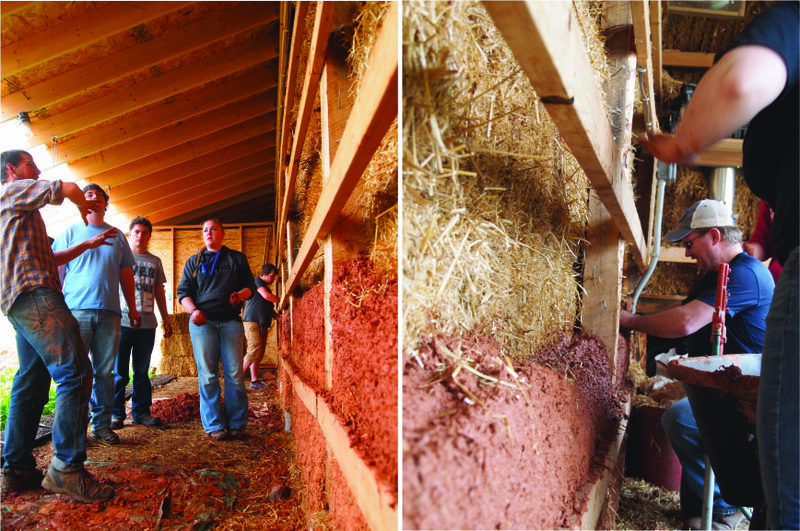 The strawbales provide insulation. The cob (6ish”) will serve as thermal mass. 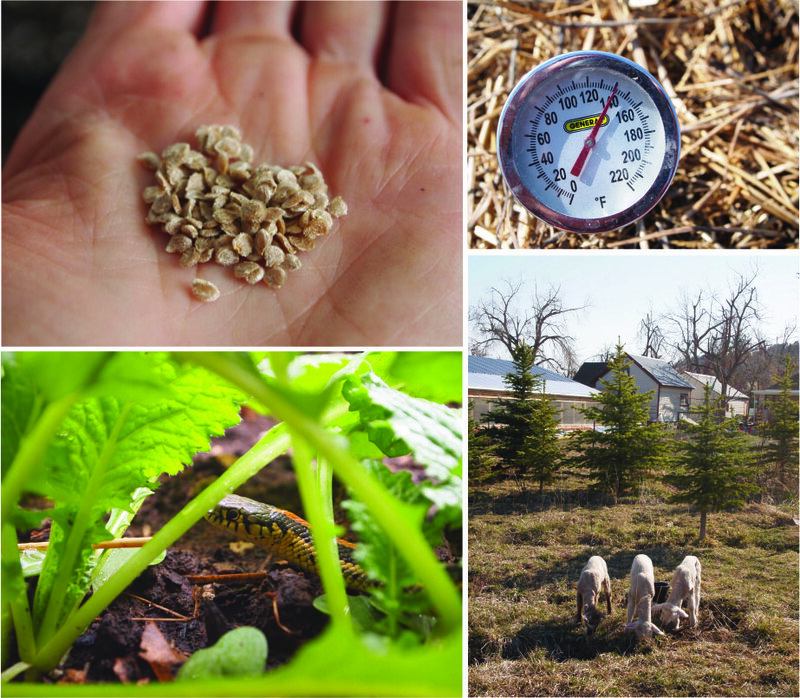 Farm touring, talking no-till organic vegetable production, and checking in on sprouting hops. We’re prepping beds for potatoes this week and we are hosting a POTATO PLANTING PARTY! We have 6 different varieties we’ll be planting this Friday evening, May 2. We’ll start at 5:30, bring a friend, dress for the weather. 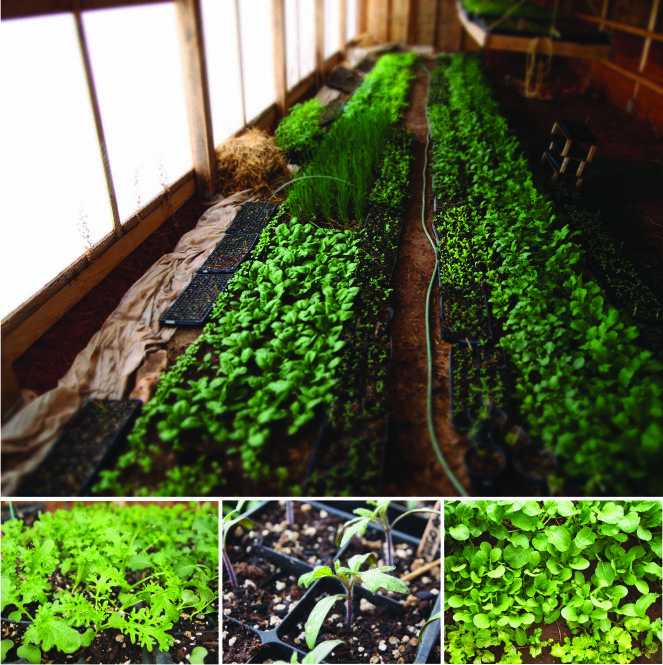 We’d love to have your help and share in the merriment of community, soil, and potatoes. bonus photos from the farm! (and corresponding sentence fragments.) Planting our saved seed is even more fun. Compost flipped and cooking. We found a snake in the greenhouse. Lambs are enjoying foraging. Ginger is presprouting in coir. Lambs enjoy exploring the coop. The birds don’t so much appreciate the lambs exploring their coop. A pink ladybug! a pink one! 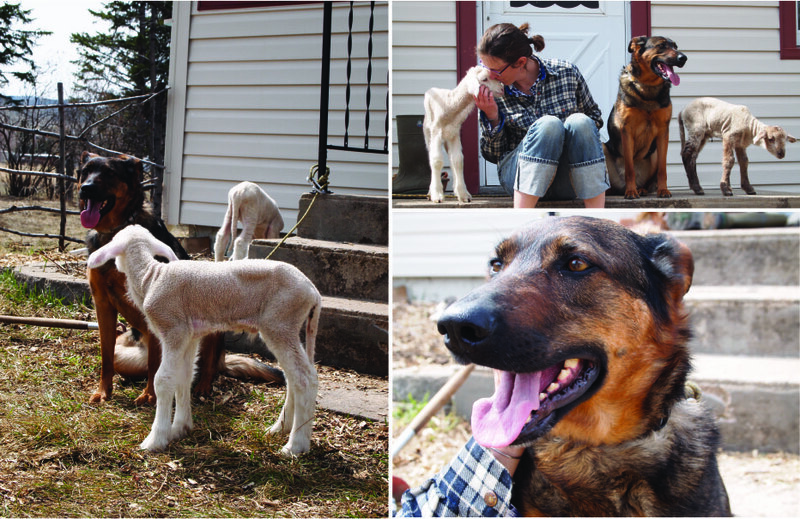 Please join us in welcoming three new farm hands, Feste, Bottom, and Speed. Introducing: our new pasture management committee. They came to the farm on April 1st and are thus named after good fools*. Currently residing in a strawbale nest arranged in the north bay of the garage, these little ones will eventually, this summer, be pastured out in the orchard. We’re looking forward to employing their services for mowing and soil fertility in rotation ahead of the broilers. The lambs will be rotated through the pasture in a fenced area, trimming the grass/weeds/etc. and adding their natural fertilizer, spurring new tender green growth and insect activity. Then we’ll move the birds through in chicken tractors, giving them more ready access to soft tender shoots and tasty bugs. 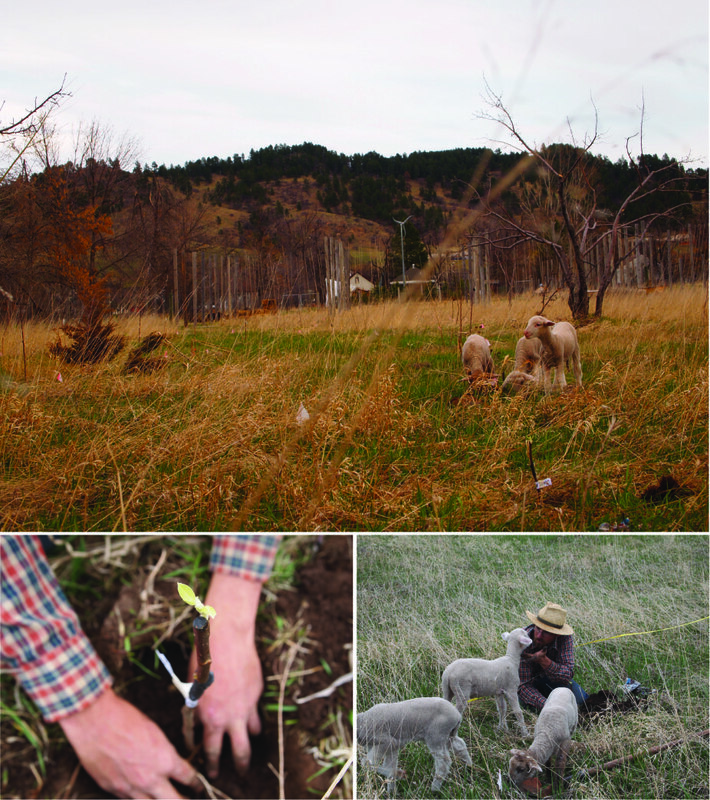 The lambs will help provide good pasture and forage for the chickens and will provide us with happy, healthy meat. These guys are now just over one week old. 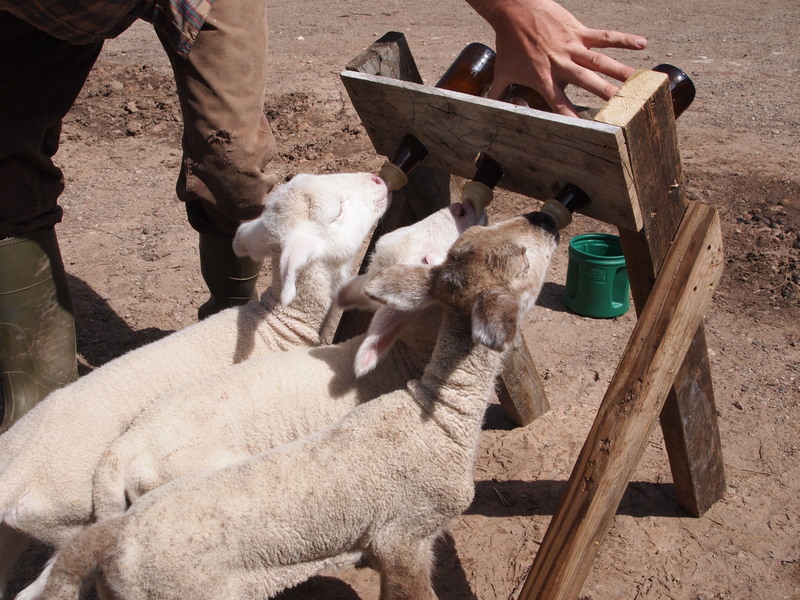 Bottle feeding is getting easier, especially since building a bottle stand. They are everything adorable and lively and lovely and loud. 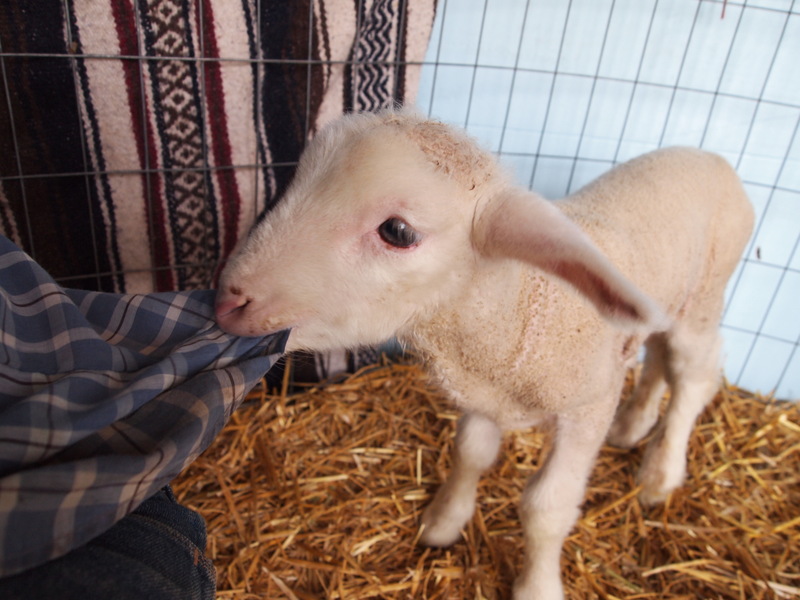 We have a new anthem at the farm these days: Baby, don’t you tear my clothes. We’re very much looking forward to the end of their early, frequent feeding schedule and the renewal of our sleep schedule. Neither of us has experience with livestock beyond the chickens and worm wrangling. We have been studying up with stacks of library books and online guides. All helpful, but really, we are most grateful for our tremendously supportive mentors, the Barnaud’s and Kelly Knispel. Thank you for your sage advise and encouragement. In other news: Pace is quickening with these longer days. We laid out thick mulch in the walkways between beds in the front field to help suppress weeds (the mulching formula: a base layer of imbricated barley bags from our neighborhood brewery, with a thick overlaying mantle of chipped wood mulch). The fruit trees are almost all pruned. We are beginning to prepare beds, planting peas, favas. We’ve resumed cobbing work in the greenhouse. Readying ginger to presprout in the basement. The house is bulging with germinating seed trays. Garlic has sprouted. Jeremy is scooting over to Bozeman to pick up potatoes from the Kimm’s (who grow excellent seed potatoes, hire handsome farmhands, and offer inspiration for land stewardship). The chickens are enjoying the thawed earth and recent surge of available protein; Polly, in particular, enjoys hopping over the fence and eating Jeremy’s field pea cover crop. We are scheming Spearfish Bike Week, ag land preservation options, and outdoor kitchen/vegetable prep area. *see Shakespeare. Feste, the clever, free-range fool in Twelfth Night; Bottom, the weaver, the comical braggart from A Midsummer Night’s Dream; Speed, a fun, mischief maker in Two Gentlemen of Verona.